4.2 out of 5 based on 24 bloggers and 2 commenters. 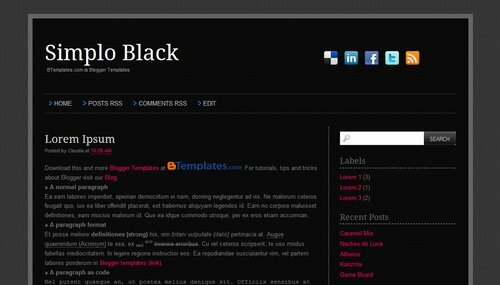 Simplo Black is a free blogger template adapted from WordPress with 2 columns, right sidebar and neutral colors. Very nice theme! I’m really love this template design, layout, and it’s colour. And I’ve been modified some elements like link’s colour, etc. To the author, please update this theme. I’ve been used this theme for a years ago and now this template no longer SEO ready.